I love to make this day special for my children. I don’t necessarily mean with gifts, but more on the lines with snacks and goodies for their little tummies. There’s nothing better than sweet and salty. It’s the perfect snack for all occasions. I love to make this popcorn mix for holidays and put it in cute dollar store containers. I usually switch out a few ingredients to make it festive. 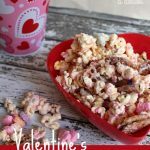 Kids and teachers love this Microwavable Valentine’s Snack Mix. The best part is that it’s so easy that your kids can help make it with you. Actually my 12 year old can whip it up himself. Combine popcorn, pretzels, M&Ms, Valentine’s hearts in large bowl. In separate bowl, put almond bark in microwavable dish and melt in the microwave one minute at a time. Stir after each minute until melted. Pour melted almond bark over dry ingredients and mix everything together with a wooden spoon . Spread snack mix out onto wax paper to cool and set for about 30 minutes. 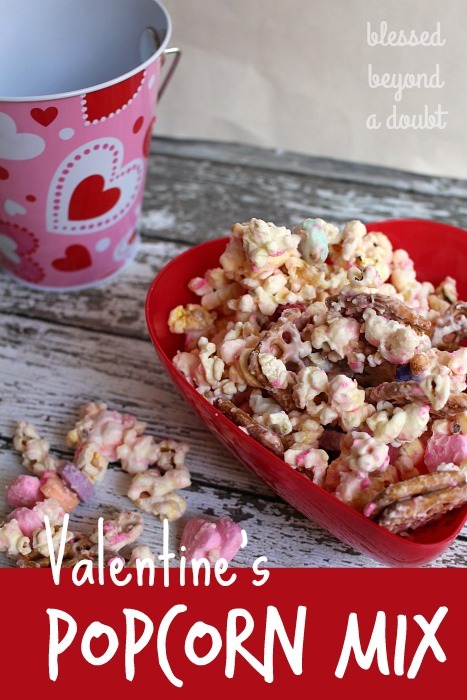 Make this festive Valentine’s popcorn mix and print out these cute Valentine’s Day cards. So EASY! It's made in the microwave. Combine popcorn, pretzels, M&Ms, Valentine's hearts in large bowl. Place almond bark in microwavable safe bowl and melt in microwave until melted. Stir every minute. 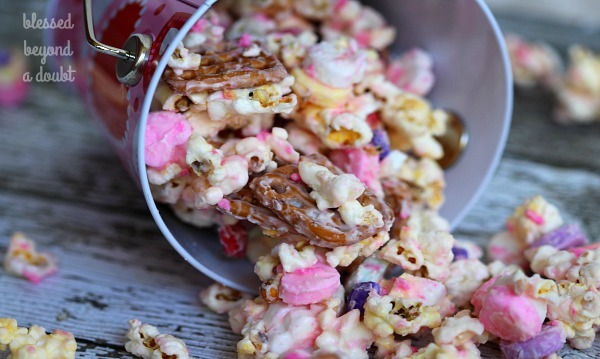 Mix melted almond bark with dry popcorn mix with a wooden spoon. Be sure to check out our St. Patrick’s Day snack mix. It’s always a hit! 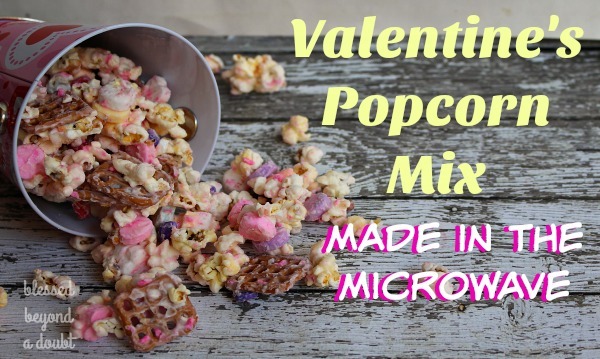 Thank you for pinning this Valentine’s Popcorn Mix for others to enjoy! This looks like lots of fun for my CC class on Valentine’s day! Thanks!